Sweet Caporal advertising back with Factory 42 ornate overprint can only be found in Series 350-460. Many collectors do not know under the ornate overprint is regular Factory 30 back. 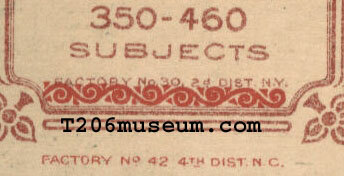 Such "secret" can be revealed from specimens that have ornate overprint not fully covered the original factory line.